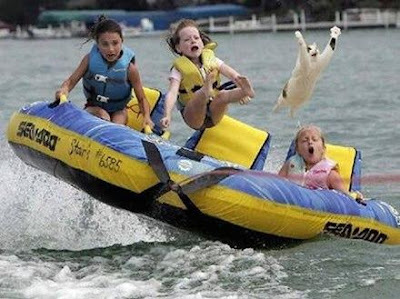 I'd hate to be the poor soul that has to pull that cat out of the water. That is going to be one seriously pissed off cat...what on earth where they thinking :P I foresee months of bribing to get back in his/her good graces. Poor kitty! If their kitty is anything like my kitties, she/he will find a way to retaliate. They will be so sorry kitty got a dunkin'. LOL...love the expressions on the kid's faces, too! But that poor cat, can't help but feel sorry for it. I have 3 kitties and they like to play in their drinking fountain but that's as wet as they want to get!